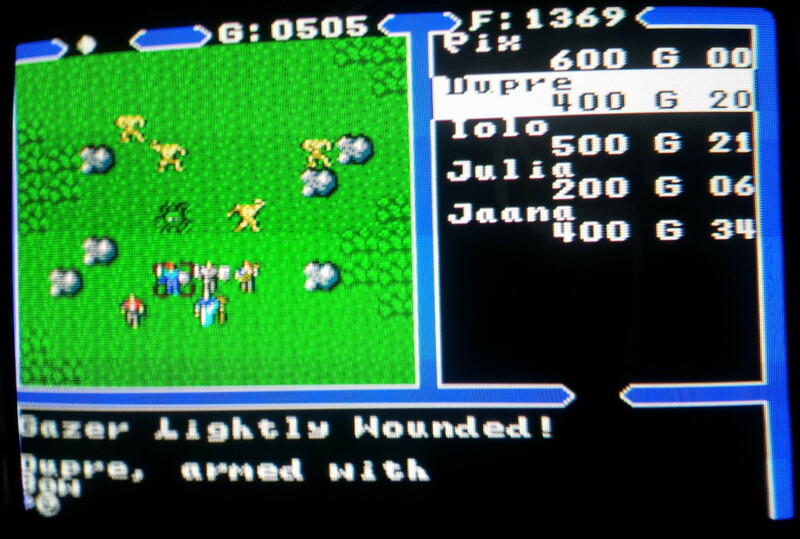 I’ve spent several hours revisiting Ultima 4 on the SMS now. It’s been a good number of years since I played U4 (NES version not included) and I’d think I’d forgotten just how good it was. It’s providing a constant challenge but there is always a goal within reach and enough variety to keep my interest going. A game this old is never going to be an easy sell to a younger gamer but once Ultima 4 grabs your attention it’s not hard to see why the game is regarded as such a classic in the genre. The SMS port has been everything I could hope for with no concessions made in gameplay that I’ve been able to notice as of yet. After raising my humility virtue so quickly in part 1, I had thought I might be in for an easy ride but all the other virtues have proven to require just as much effort as on the PC. The combat isn’t as slow going as I’d feared but controlling a party of 8 is undoubtedly going to be harder work than I’d like when I make it that far. My combat strategy so far is simply to arm every party member with range weapons and attack the nearest monster and it’s proven extremely effective, not to mention fast since I don’t have to manoeuvre each person too much. 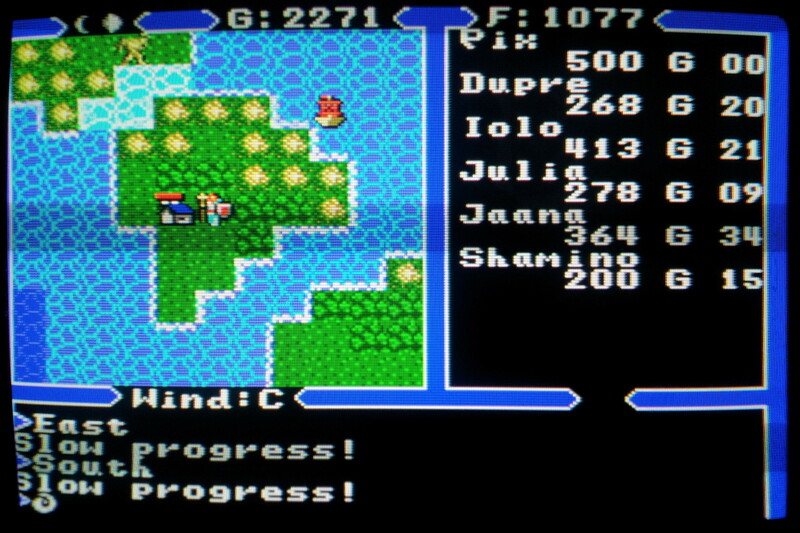 The combat system does have one tweak over Ultima 5 in that I can only cycle between monsters when chosing what to attack which is a real timesaver. 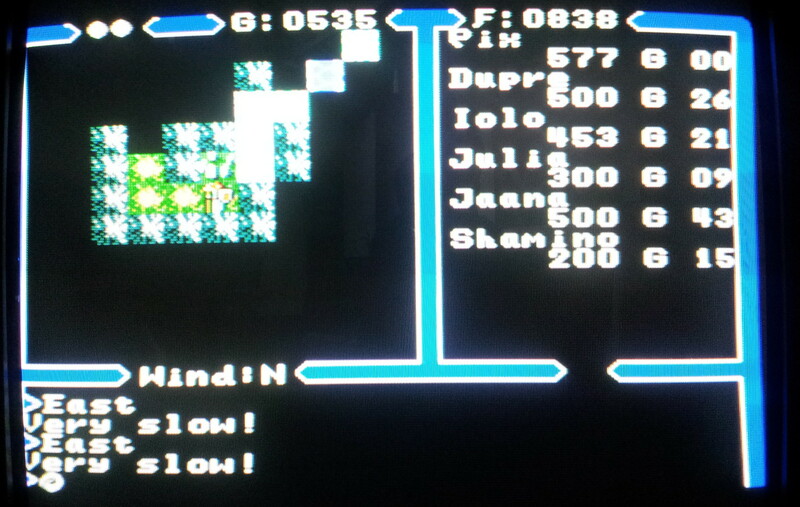 Another thing speeding things up is that I think that the PAL version I’m running appears to have been speed corrected. For those that don’t know, the TV signal here in the UK runs at 50 FPS instead of the 60 used in NTSC for the USA/Japan. Most of the consoles that made it over here were fairly crudely adapted for PAL which meant that we ended up with huge black borders and the top and bottom of the screen and a squashed up game to play in the middle. To make matters worse, many (probably most) games from other countries were not adjusted to run at the correct speed and simply ran slower when played in PAL. All of this led to many people (myself included) modding their machines to add switches to swap between 50/60 Hz and since I prefer a full screen I’ve been playing this at 60. From the speed of the music I suspect that it’s running a little faster than intended although the game speed is about spot on as far as I’m concerned. My biggest problem so far has been getting a boat. They are incredibly scarce in this version and I spent at least 30-45 minutes wandering around coastlines before I finally saw one. Taking the moongate to Jhelom and walking back and forth was what worked for me in the end. I eventually ran into another ship on the high seas and led it to what I thought was a convenient spot on the Cape of Heroes. Under the impression I had this backup, I didn’t think twice about sailing through the whirlpool when I happened on it later on thinking it was a good chance to get a boat ready for transport to Cove. I only realised after that my boat was in an unreachable spot so I’m once again landlocked until I manage to find another. I’ve made steady progress other than this. 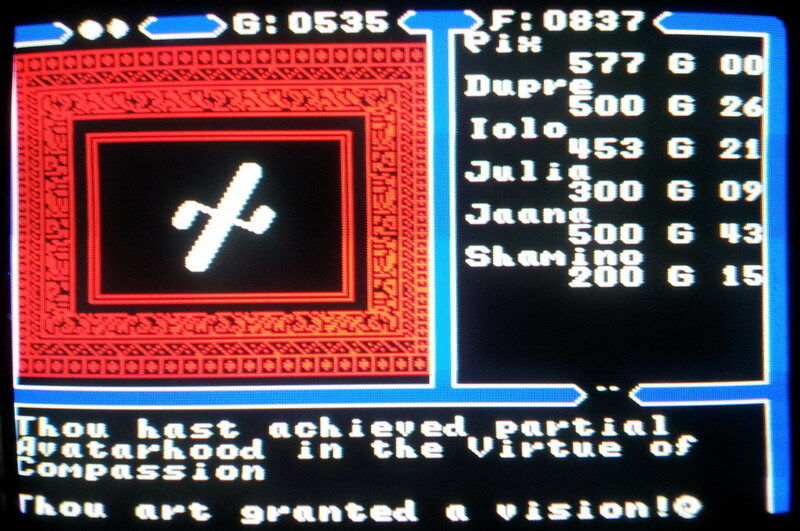 I have all the runes and am now 2 parts Avatar and ready for all the other virtues except honesty. 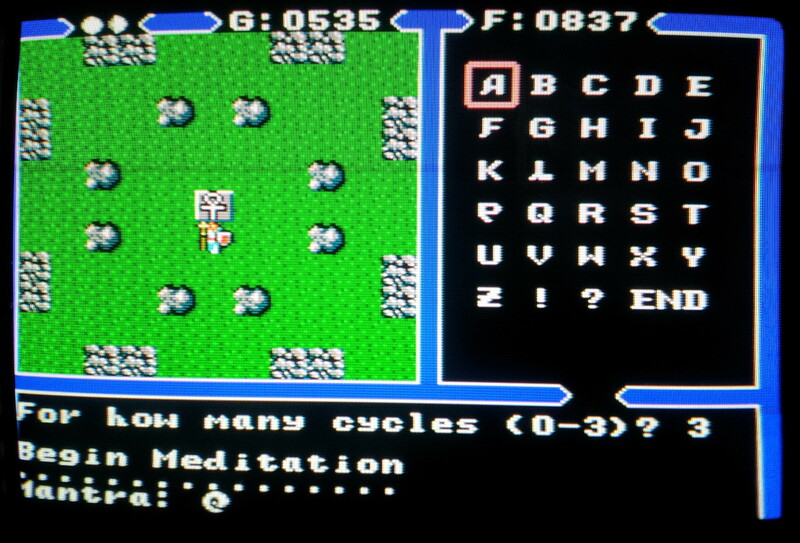 One thing to note is that every time I need to use a mantra at a shrine or elsewhere I have to key in it which theoretically means that this game may be completable without bothering with all the conversations after all which is a nice touch for experienced players. I’ve slightly mixed feelings about the conversation system keeping track of everything for me. It saves keeping notes for the most part but it’s not unreasonable for a player to go around asking everyone about mantras and runes once they get the idea of how things work in Britannia. I do like the freedom of a text interface at times but the keyword system still represents an improvement on the whole. I’ve still got work ahead of me before I venture into the first dungeon but I’m close enough to say that for the overworld part of the game at least, this has been my favourite version of U4. It looks, sounds and plays as well or better than any version I’ve seen and the interface is incredibly quick and easy to use considering there are just two buttons. It even has enhancements like 3 save slots which is a real luxury. It remains to be seen what I think of 2D dungeons and I intend to venture through several of those before the next post. That could be slightly delayed as I’ve just received a BBC Master and an Amiga 1200 today and I’m extremely keen to have a play around with them. You can guarantee I’ll have been playing some Elite before part 3.